Who is the idiot that decided to delete cookies - including login cookies - every time I quit TenFourFox without any option to do otherwise? I was all set to switch over from Camino but this fresh hell of stupidity is a deal breaker. The cookie preference either doesn't work or isn't working. I appreciate your frustration, but we're volunteers here -- there's no need to be unpleasant. You don't pay us for this and you don't have to use it. In reference to your report, you probably have a leftover setting you need to look at. Go to Preferences, then Privacy, and look under the cookie settings on that tab. The relevant settings are "Accept third party cookies" and "Keep until" (and possibly Clear history when TenFourFox closes). These might have been set a particular way from an older version of Firefox. If twiddling these doesn't fix it, it's time for a new profile (see How to reset your profile at the lower right). On my test systems, cookies and login cookies persist, if those options are set appropriately. Sorry about that. That'll teach me to eMail when eye-bleeding angry. I hate 'moving in' to a new browser - Facebook is incrementally dropping support for Camino by making little things here and there not work anymore. Actually found that leftover setting on my own. Again sorry. "Accept third party cookies" and "Keep until" (and possibly Clear history when TenFourFox closes)..."
I will try to attach 2 screenshots. You are right that they are definitely NOT easy to find & delete. 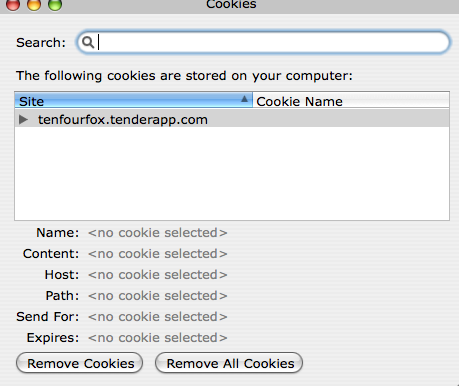 Since I constantly delete cookies, in other browsers I have it set to "NEVER STORE COOKIES" but 10/4-Fox offers no such options, nor an easy way to simply delete them all the time while browsing. Just trying out your browser tonight for the first time. The fact it won't show my Safari bookmarks either, even though it said it had them in the initial set up, is a No-Go, though. Thanks anyway. 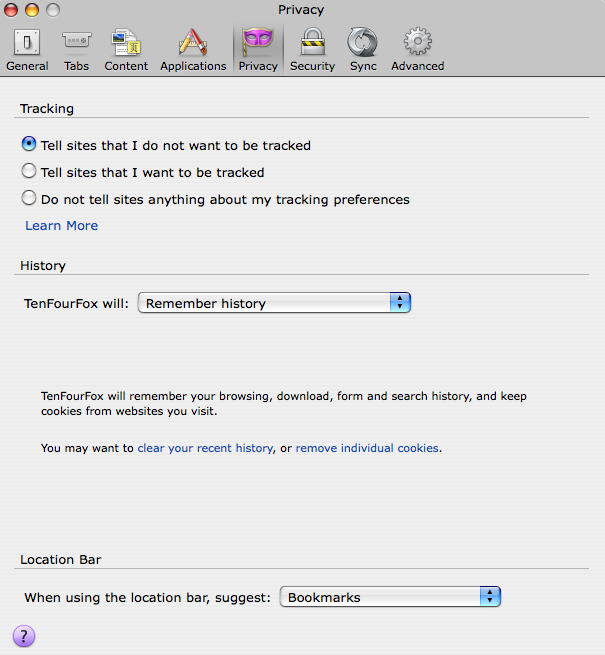 You need to choose "Use custom settings for history" from the "TenFourFox will" drop down box to enable those options. You can clear most settings manually, including cache, from History > Clear Recent History. Please note that we mirror Firefox's UI in almost all cases -- because of maintenance burden, only in exceptional circumstances does the TenFourFox user interface differ. The current version of Firefox works the same way in both these cases. And re #2 tip, thanks, but you still have to OPEN the preferences to do it, rather than a quick "DELETE HISTORY" & "DELETE COOKIES" in the drop-down-menu of the TFF icon. As for UI, I never used FF in the past because it was always such a ram hog & seemed to be so weighed-down/burdened/slow, etc., so never really got familiar with its UI. At least TFF is Newer than my old Shiira browser which still works great, but they don't update it ever since it's inception. And Tiger's 4.1.3 Safari makes crunching noises of late whenever it is opened so I quit using it for now. "You don't pay us for this and you don't have to use it." Er, actually, people do have to use it--or else toss their otherwise perfectly good G4 or G5 into the trash. There are just too many things these days that require you to go online, and Safari doesn't work anymore with a lot of websites.